Finally, it was the turn of Key Stage 1 to take over the Lent Fundraising - they did a brilliant job of organising their stalls and had lots of happy customers! We were visited by a reporter and camera man from the BBC who came to talk to some children about Mothering Sunday and what their Mums mean to them. The short film was on Look North and is also on social media. Click on the link below to find out what the children said about their wonderful Mums. The Lent Fundraising got off to a great start with Classes 5 and 6 organising and running their fantastic stalls. There were bake sales, raffles and competitions and lots of willing customers. All the money raised during Lent will go to our two charities this year which are Young Minds And Burmantofts Senior Action Group. Well done to all the children and of course all the customers! Next Classes 3 and 4 took over the fundraising, they have had some brilliant ideas and have been very busy on their stalls. Excellent work everybody. On Tuesday 19th March, author, Ruth Eastham, spent the day in school working with children in Key Stage Two. Ruth is the author of five award-winning books. She enjoyed delivering an assembly to the children before spending a session with each class, where she read extracts from her books, gave some useful writing tips and helped children with their story writing technique. We had a lovely day! Together Network and the Church Urban Fund, are working to raise awareness of food poverty in the UK. As part of this campaign, one of last year's Great British Bake Off finalists, KimJoy, came in to school to talk to some year 3 children about this issue and to also make some lovely pancakes for the children to eat. They had a great time practicing their pancake flipping skills! Another brilliant time for year 3 and 4 at Leeds Minster when they took part in the annual Shrove Tuesday pancake races. We recently had our Rotary Recital final in school. Children across school had learned a poem by heart and performed it in their class. The theme this year was Friends and Family and the two finalists from each class were wonderful. All those who were in the final received a certificate and a book and the winners also were presented with a cup by our panel of judges. The key stage one winner was Lakeisha and the key stage two winner was a joint entry from twins Ebun and Ore.
On Friday we had our annual Faith Day with a focus this year on Superheroes of the Bible. Children worked in mixed age groups and visited each classroom to learn about a different superhero. They heard stores and took part in activities. Elijah- Elijah trusted in God even when things were difficult. Children made treasure boxes and put in prayers to help others. Abigail- Abigail teaches us about using words carefully so they don't hurt others. Children shared things they wanted to say sorry for. Joshua & Caleb - Joshua and Caleb were able to see past difficulties to enter the promised land. Children were taught the song Every Giant will Fall. Barnabus - Barnabus was great at encouraging others. Children made cards to encourage each other in lots of ways. Samson - Samson protected people with the strength God gave him. Children wrote their strengths on dumbbells. Esther - Queen Esther saved the day from Haman, the King's adviser. The children make a clacker to remind them of him. Noah - Noah did as God asked even when everyone doubted him. Six pupils from year 4 were invited by ACE to take part in a Dodgeball Tournament against other schools in the city . They did really well and came 4th out of 10 schools that attended. Our friends at the Rotary Club of Headingley gave us a very generous donation towards the cost of creating a sensory room at in our Community Room. The 'Rainbow Room' is fantastic and lots of our children love to spend time in there and really benefit from it. Thank you Rotary! The children in KS1 and Reception had a fantastic party today. We had a special visitor too. We have won the Inner East Cluster Attendance Award AGAIN! Well done to all of the 164 children who attended school EVERY DAY in November. Mrs Morton from the cluster came to present the trophy. 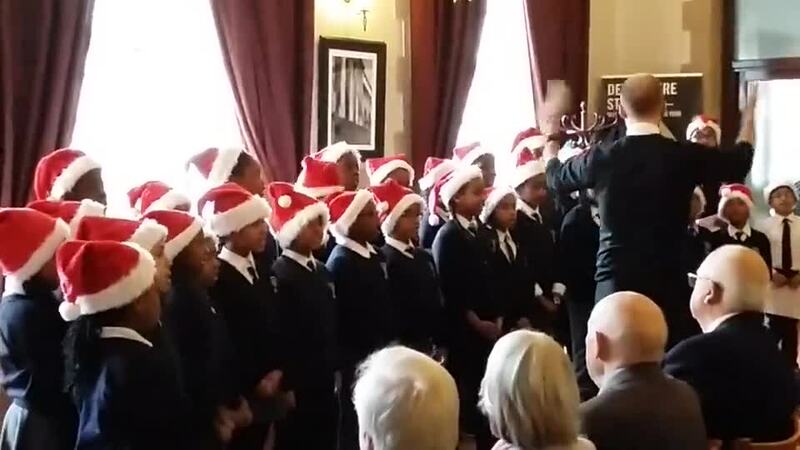 This week the choir performed a range of songs at the annual Rotary Club Christmas dinner. it was a lovely occasion and we were welcomed by the President Paul. Well done to all the children for their wonderful singing. This week the children visited Thackrah Court to sing for the homeowners. They sang lots of carols and Christmas songs and then had some time to go and meet everyone and chat about Christmas. This year, the children performed a lovely Nativity called 'Is there a Baby in There?'. All the children sang, acted and remembered their lines perfectly. Lots of parents came along to watch and thoroughly enjoyed the show. 12 children from classes 4 & 5 were invited by the Northern Ballet to participate in Ballet classes over a period of 8 weeks. The children learnt the fundamental steps for ballet , such has how to improve posture and balance. On Monday the children visited the Northern Ballet college and had an opportunity to show their parents what they have been learning. They all did really well and enjoyed meeting two students from the college who showed the children some of their routines . Everyone was awarded a certificate and a big thank to Henry their Ballet teacher. Each half term, those children who come to school every day and are never late, have their names put into a hat and winners are drawn for amazing prizes. Well done everybody. The School Councillors did a great job decorating the Christmas Tree this year - it looks fantastic! St Peter's recently entered an inter-school cross country event which was held at Cardinal Heenan High School. Our children all ran really well and Ellta Mulubrhan came 4th in her event. Today we celebrated the end of our International Week with everyone wearing their traditional clothes and bringing in food from their country. It was a brilliant morning where we all came together to eat, chat and then visit all the classes to see what the children had been learning. Class 6 sang a song in Italian, Class 5 counted in Japanese, Class 4 sang a song from Switzerland, Class 3 shared an elephant procession from Sri lanka, Class 2 taught us hand symbols from India, Class 1 performed a New Zealand Haka, Reception sang a song in French and nursery taught us about Eritrea. It was great to see so many parents who made such a brilliant effort. Voting is underway for the School Council of 2018-19. Classes three, four, five and six, have each voted for a boy and girl candidate from their class. Mrs Holliday will announce the winners of the vote in today's worship assembly. On Saturday morning, all the children racing in the cross-country event at Cardinal Heenan did another excellent job despite the rainy and windy weather! It was lovely to see all of the children supporting and cheering one another on; the St Peter's 'We Care' motto really shone through! A special mention must go to Natty (Class 4) and Elim (Class 5) who slipped over, but got up anyway and completed the race! On Friday year 3 led a lovely Harvest Festival celebration all about the way bread is made and celebrating breads from all around the world. The children made Harvest Sheaths in class and presented one to each class to share. It was a great celebration and parents and pupils enjoyed the celebration, singing and prayers. So much food was donated for Harvest and we will be sending this to the local food bank and Caring for Life, a Christian charity in Cookridge. Every year we meet as a governing body for our annual away day. This is to review our work from the last academic year and plan our priorities for the coming year. Our meeting this year was very informative and inspiring, allowing governors to work together to look at their impact and share thoughts for the coming year. Key Stage 2 and Class 2 had a fantastic visit from a theatre group showing us how to beat the bullies! It was lots of fun. This Autumn/Winter St Peter's children will be taking part in cross country races along with other Leeds Schools. Their first competition was at Middleton Park and all our children did very well on a beautiful sunny day. Following a Workshop for Classes 4 and 5 run by Northern Ballet, some children were picked to attend a series of classes after school to learn some Ballet skills. Well done to Yonatan and Tayvia who won a prize for bringing back their end of year questionnaire. Thanks to all the parents who sent them back. Well done to all the children who got a prize for having 100% attendance this half term and being on time every day. They were chosen at random from lots in each class and they each chose a prize from the table. The children all enjoyed a fantastic sports day this year - there were lots of different activities and the sun shone all day. We had lots of fun on fun day! Class 6 put on a fantastic performance of 'Over the Rainbow' for their end of year production. The children acted and sang brilliantly, accompanied by the rest of the Key Stage 2 children, and lots of parents came along to enjoy the show. Nursery learned a song with actions all about St Peter and they made fish to go in his net, including giant ones on the interactive whiteboard. Class 1 looked at the symbols of St Peter and then designed a new school badge using some of the symbols. Class 3 made cards to celebrate St Peter after learning about the symbols . Class 4 explored the lessons that St. Peter taught us throughout his life. Class 5 researched St Peter using the iPads. They explored his life and the messages he gave us. They produced booklets about him. Class 6 learned a song about when St Peter was arrested and then saved by an angel. They added actions to the song and performed it for the whole school in assembly. We had a special Eucharist service in the afternoon. The whole school came together to celebrate St Peter. Canon Sam and Mrs Brown, the Chaplain from Abbey Grange, led the worship. There were prayers and songs and many staff and older pupils came to take the bread and wine. After the service every child received a blessing as they left the hall. It was a wonderful afternoon, if a little tiring for some. This week Andrew Graham from Radio Leeds came to visit school. It is 50 years since the start of the radio station and he came to show the children some of the equipment that was used 50 years ago. The children had to guess what it was used for and their discussion was broadcast on the radio the next day. Some of our year 2 children were invited to take part in a Dodgeball tournament organised by ACE club. They played against 9 other schools from the East Leeds area. All the children played really well and enjoyed taking part, they took a runner up place. Every half term we celebrate the amazing attendance of our children. All those children who have been in school on time every day for the half term get entered into a prize draw and a winner is drawn from each class. This half term's winners were Mary, Ethan, Steven, L'Kai, Clecia, Sarah and Lamiek. This week, Class 6 all come to Breakfast Club for a special SATs Week breakfast. They enjoy bacon and sausage sandwiches, cereal, toast, fruit and juice and have time to relax and chat with their friends. We have taken some very important letters home about the General Data Protection Regulations which begin on the 25th May 2018. We had an assembly to explain a bit about it and we are going to try really hard to get our letters signed and then return them to school. We are going having a competition to see which class brings them all back first and the winning class will get a class reward. Good luck everyone! The chicks have hatched. They are very, very cute. Can you think of some names for them? The rain held off for our annual sponsored walk at Roundhay Park. The children all joined in enthusiastically and we have raised lots of money for our 2 Lent charities - Mencap Leeds and Felicia's Courage. Well done everybody! Health for All, who run our Active Kids sessions for the children, are now running healthy cooking session for parents. This week parents made banana pancakes, whilst their children joined in the Active Kids club. The children enjoyed eating the pancakes after their session. Next week they will be making vegetable soup . Parents have enjoyed a course on how to make Story Sacks for their children. Over the 8 weeks, they have created sacks that contain items to help their children improve their reading, writing and numeracy skills. All the parents really enjoyed the course and were pleased with their story sacks. Today we had visitors from the British Military Martial Arts School. They talked about keeping fit and how to show self control and respect. The children really enjoyed the sessions. On Friday afternoon Chris Walbank, one of our school governors, came to present prizes to pupils who had won a story writing competition. Chris had read all the entries and chosen a winner from each class. The children had written their own versions of traditional tales and we were delighted with their efforts. Each child was presented with an Easter egg and a new book and their stories have been published on the Pobble website. This year our Faith Day focused on 'The Life of Jesus'. We worked in mixed age groups and travelled around classes exploring His birth, baptism, friends, miracles, parables, the Lord's Prayer and Easter. Key Stage 1 and reception had great fun running their Lent stalls. They had buns, biscuits, raffles and pin the tail on the bunny, as well as lots of competitions. Reception children made jam sandwiches on a Friday which were delicious. Thanks to all those who have organised fundraising stalls during Lent. This week it was the turn of Years 3 and 4 to set up their stalls for Lent Fundraising. The have some great ideas and business has been brisk! This week year 5 and 6 are raising money during Lent. They have come up with their own ideas for competitions and games to run in the playground. There were lots of customers. Years 3 and 4 enjoyed a brilliant afternoon at Leeds Minster taking part in pancake races. The children also got to try their very own pancake! Huge Congratulations to Medhin Medhane and Blythe Carag - What fantastic Performances! This week we celebrated Safer Internet Day. The theme this year is "Create, connect and share respect: A better internet starts with you". Miss Parry was very impressed by the very thoughtful and sensible responses in assembly on Wednesday! A lady from the Leeds City Council Road Safety Team came into school to advise parents about how to keep their children safe on the roads. Her advice covered infant car seats and booster seats, the latest laws about children travelling in cars and guidance on how to teach your children to be safe on the roads. School were contacted this week by the Pobble team, to be informed that Sinar had won a special 'Narrative Ninja' prize at the Pobble 2017 Writing Awards. Sinar produced a fantastic story about a mystery present and this was judged as one of the best pieces of narrative writing from a child of his age during 2017. He received a certificate and a special t-shirt as a reward! Well done Sinar. Our Key Stage 2 Choir performed twice this week; once for our friends at Headingley Rotary and again at Thackrah Court Residential Home. The children were fantastic, they sang beautifully and were a credit to St Peter's. Every year, the Inner East Cluster runs a competition to see which school can achieve the highest attendance in November. Once again, St Peter's were the winners, with a brilliant 98.9%. The ladies from the Cluster came in to present the trophy to school and also to hand out certificates to all children who came to school every single day in November. The children had a fantastic time at their Christmas party, they had lots of treats and enjoyed some brilliant singing, dancing and party games. The children in KS1 and Reception performed 'There's Something Amazing Going On'. They were fantastic. They has lots of words to remember and the singing and acting was amazing! Well done! Five children from class six joined children from four other schools, for a morning of fantastic writing. The children imagined that they were a window and they had to describe its past, present and possible future. Well done to Aaron, Cyprian, Medhin, Meroan and Mansour. Your work was amazing! Each half term we celebrate how many pupils have had 100% attendance and have been on time every day. One child from each class has their name drawn to receive a prize. Well done to ALL the pupils who have been recognised for their excellent attendance and punctuality. This time, the winners were Melissa, Yosias, Mirad, Joseph, Mercy, Blythe, Lucas. A big well done to everybody, this year we raised a fantastic £149.12 for Children in Need. We are running Maths Workshops every Monday afternoon in the community room from 1.30pm - 3pm. These workshops are to enable parents to help their children with the Maths they are learning at school - all parents are welcome to come along. International week is a wonderful time at St Peter's. During the week the children learned about different aspects of the country their class had chosen, such as It’s location on a map, the capital city, a simple song from that country, the main religions and the traditional dress. On Friday, lots of families brought food from their home country to share with everybody and the parents toured the school to see what each class had learnt. The winning candidates were Xavier, Meroan, Ava, Kylan, Leona, Yosef, Chloe Carag and Sinar – Congratulations! Following the problems with gas in the area last week, Northern Gas very kindly sent a fish and chip van to school to give the children a Friday treat - it was very well received! Bob Hartman, a renowned American Christian author, spent a day at St Peter's. First of all we met in the hall and Bob told us the whole Bible in one story. After that Bob delivered workshops to Classes 2, 3 and 5. Mr Bates, one of our friends from Headingly Rotary, comes into school once a week and helps the children with some gardening. This week they were planting some daffodil bulbs ready for Spring. Huge congratulations to Class 2 and Class 6 who were the winners of the annual attendance treat! Extra congratulations to Class 2 who have won this prize very year since they were in Reception - keep up the good work! Despite the very soggy start to the day, we still had lots of fun and even managed to play in the paddling pools! Class 2 Go to the Seaside! Class 2 had a fantastic time in Filey. The sun shone all day so, after a picnic lunch, the children played in the sand and had an amazing time splashing in the sea, followed by ice cream and a sleepy journey home! This year's summer production of Matilda was a huge success - the children sang and acted brilliantly and the Key Stage 2 choir were also amazing. The 2 steel pan groups also played at the show and demonstrated the fantastic music they have learnt over the year. All the parents were very impressed and very proud - well done everybody! Our children who are starting Reception in September came along for a Stay and Play session this week. They had a great time exploring the Reception classroom and getting to know each other..
On Saturday pupils from St Peter's joined pupils from Shakespeare to take part in a parade at the Burmantofts Gala. The children dressed in their traditional outfits to represent the country they were from. It was a lovely day where thw whole community came together to enjoy games and social activities. many thanks to all the children and families who joined in. The School Council were joined today by two visitors from Leeds City Council, who spoke to them about the Summer Reading Challenge. The children have been given the task of championing reading for pleasure and to promote the use of local libraries. The Summer Reading Challenge is a free activity, which challenges the children to read and complete six different books during the summer holidays. The children can collect stamps and 'scratch&sniff' stickers as they complete their books. There are gift packs and medals for all children who complete the challenge. The School Council are now going to prepare posters and an assembly, to promote the challenge to the rest of the children at St. Peter's. Every morning in SATs week, the Year 6 children enjoy a cooked breakfast before school starts. They have bacon and sausage sandwiches, fruit, yoghurts, cereal and juice, whilst relaxing and chatting with their friends. Reception Class enjoyed a visit from their parents recently. The children shared their library books, which they chose on their trip to Compton Road Library, and the parents also had the opportunity to look at the children's work in their profile books. It was lovely to see so many parents in school. A consultation is now live asking the city to comment on site options for the proposed Roundhay Park Primary free school. A free school bid from the Roundhay Park Primary School Trust has been approved by the Secretary of State for Education to provide additional school places in the Roundhay area. There are four sites which have the greatest potential to host the school; however there are issues with each of them. One of these sites is on a part of Roundhay Park so Leeds City Council feels it is right that the whole city has a say on whether it should be further considered for this purpose. On Wednesday and Thursday children visited Roundhay Park for our annual sponsored walk. The children did lots of laps around the park and will now collect money from family and friends to donate to our Lent charities. This year we raised an amazing £160 for Comic Relief. Well done everybody, especially the fantastic girls for selling Red Noses. Children announced the winners of their Lent competitions in assembly on Friday. Well done to all the children who entered and raised such a lot of money. Classes 5 and 6 spent this week fundraising for our 2 charities. They sold biscuits and buns and ran competitions and raffles . They raised £120.00 between the 2 classes. Children are taking home these money boxes to fill with money as part of our Lent fundraising. This year the children were in their mixed class groups and treated to a trip around the world, learning how Easter is celebrated in different countries. Their journey took them to Eritrea, South America, Jamaica, Philippines, Eastern Europe and Nigeria. Each child completed a story at home for homework. Five pupils from each class were chosen for a prize. They could choose from books or writing materials. Let's hope that they are inspired to keep on writing. During world book week children were asked to continue to read at home using our online scheme Bug Club. All these children completed lots of books and were given a special prize. Classes 4 and 5 recently had a visit from Mr Swidrack from the Yorkshire Rose Art Project. They spent the morning in the hall looking at an exhibition of artwork by famous Yorkshire Artists and then they went on to produce a piece of artwork representing the White Rose symbol. All the children thoroughly enjoy their creative morning. On Shrove Tuesday, Classes 3 and 4 went down to Leeds Minster for the annual pancake races. They all had a great time and thoroughly enjoyed eating their pancakes afterwards! In assembly we have been learning about Shrove Tuesday. Helen and Amal had a go at tossing pancakes. They managed 20 times without dropping it! We will be visiting the Minster for our annual Shrove Tuesday races with classes 3 and 4 today. Congratulations to Ara Baki in Class 5 and Alice Mason in Class 2. Each year, the children in each class work really hard to learn a poem by heart. They then perform their poems to their class and 2 winners from each class are chosen to perform their poem on the stage in front of a panel of judges and the rest of the school. Once again, the children were amazing and performed their poems beautifully. The Key Stage 2 children have also been learning some special songs for the Recital event and these were sung wonderfully on the day - all in all a great afternoon! Parents attended a First Aid course run by Thinktank training solutions. The course ran for 3 weeks and Parents learnt how to give care to an infant or child who has been injured or become ill, prior to the arrival of qualified medical staff. Some of the topics covered were CPR, choking, head injuries, burns & scalds, bleeds and minor injuries, plus much more. All parents who attended gained a certificate and a good knowledge of First Aid. We hope to run another course soon, if you are interested please contact the school office. Each half term we are going to celebrate how many pupils have had 100% attendance and have been on time every day. One child from each class had their name drawn to receive a prize. Well done to ALL the pupils who have been recognised for their excellent attendance and punctuality. There are reports in the news today about an e-safety incident involving primary age children from Leeds using an app on their mobile phones. The incident is now being investigated by West Yorkshire Police. This incident has highlighted a number of safeguarding issues raised recently about smartphone ‘apps’ including Live.ly, ooVoo, and musical.ly amongst others. These apps are supposed to only be able to access contacts on the user’s phones, but it appears that quite quickly unknown individuals are able to join group chats. Therefore, these apps are not safe for children to use as there is a significant risk of inappropriate contact by unknown individuals. There is some useful information on the LSCB website about online safety with some useful tips for parents here http://www.leedslscb.org.uk/Parents-Carers-Wider-Family/Keeping-children-safe-online. Message from West Yorkshire Fire and Rescue Service about treating head lice. The Key Stage 2 children had a lovely afternoon, they had games and music in their classes, followed by a party tea in the hall. Happy Christmas to the Dinner Staff! Every Christmas, the children sing some Carols for the Dinner Ladies and Cooks a give them each a Christmas present. The children particularly love it when the Dinner ladies give them a big kiss! The children had a fantastic party, all topped off by a visit from Father Christmas who visited all the children in their classrooms and brought them all a Christmas present. During November, the Cluster run a competition amongst all the local schools to encourage excellent attendance. Once again, St Peter's were the winners and our attendance for the month was an amazing 98.9%! Class 5 were the best class in school and they all received medals. The Cluster also put the names in a hat of all the children from all the local schools who came to school every day in November - the winner drawn this year was Nathan Simon in Class 1 and he got a brand new bike! Congratulations everybody! This year's performance was as wonderful as ever, with amazing singing and dancing, a performance by the steel pans group and the Year 5 class played their recorders. The children sang, danced and acted their hearts out in this year's nativity. Lots of families came along to enjoy the show and all the staff and parents were very proud. Congratulations to Everybody at St Peter's for raising a brilliant £139.72 for children in Need. On Friday 18th November, two school Governors joined the School Council for their weekly meeting. They listened to the children reporting back about the Bookfair, which they organised and about the Pupil Questionnaire, which was carried out in July. The discussion was really interesting and the children appreciated being given a voice to share with important adults. The children had a wonderful time during International Week, they learnt lots of interesting facts about the country their class had chosen and practiced a song or dance to show the parents. On Friday, lots of parents brought in food from around the world to share with the other families and they enjoyed a tour of the classes to watch the children perform their songs or dances. The children all dressed up in traditional clothes and looked amazing! This annual event is to evaluate the effectiveness of Governors over the past year - sharing the monitoring they have done is school over the year. They also worked in teams to prioritise the areas they are going to monitor in school over the coming academic year. After the votes were counted, the winners were announced in Friday assembly - Congratulations! It was School Council elections last Friday and after some serious campaigning, the polling station was opened! A new group have started learning the Steel Pans and are really enjoying the lessons. They'll be practicing hard every Thursday ready for their first performance to parents at Christmas! Mr Bates, one of our friends from Headingly Rotary, has been visiting school every week to do some gardening with our children. Here, some children from Class 3 are planting onions. When they have grown, the children will use the onions in their cookery lessons. Four of our Year 5 & 6 School Councillors were invited along to Leeds Civic Hall for an exciting event focusing on Youth Voice within the school, the community and Leeds as a City. The children got to meet children from other schools across Leeds, take part in interactive workshops, meet the Lord Mayor and learn all about democracy. It is our first day at school. We are having lots of fun! This year, classes 1 and 4 won the attendance award and enjoyed a visit from the ice cream van - well done everybody! Attendance overall has been amazing this year - keep up the good work! Despite the heat, the children were brilliant - they all tried their hardest and had a fantastic afternoon. Lots of parents were there to offer their support. On the hottest day of the year, the children had a brilliant sports day - they had running races, sack races, egg and spoon races, plus much more. Lots of parents came along to cheer on their children and everyone had a fantastic time. FS and KS1 Fun Day! We had a fantastic day! We went on the bouncy castle, inflatable slide, played football with the giant ball, rode our scooters, painted, played tennis AND cooled off in the paddling pools! Many thanks to all the helpers who worked to clear the sports pitch at Bridge Community Church this week. When we arrived the pitch was covered in cut down trees which we dragged onto the grass area. After lots of sweeping and tidying up the pitch looked great. Hopefully our pupils will be able to use it in September. Mr Stuart organised a fantastic competition for Key Stage 2. 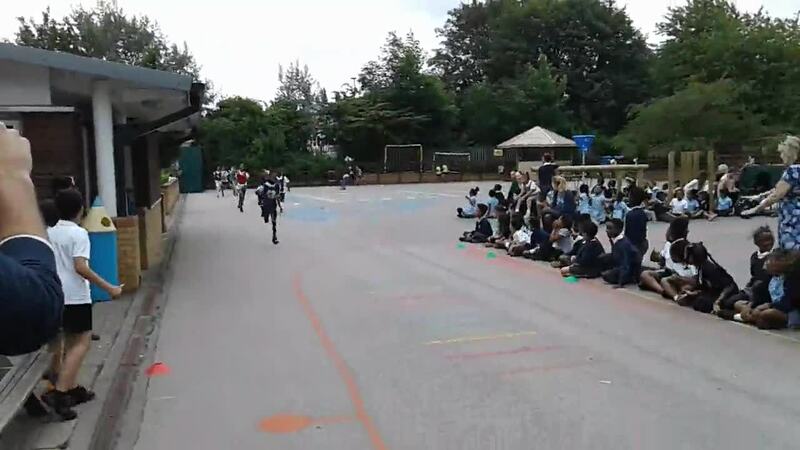 Each class ran the Golden Mile and the fastest runners from each class were chosen to compete against the rest of Key Stage 2. It was a highly competitive event, with some amazing runners. The winners were Lily Bickle from Class 3 for the girls and Mansour Shurkian from Class 4 for the boys. The winning team was Class 4. Well done everybody! On Thursday 30th June, girls from years five and six played a game of 9 a side football against Ebor Gardens Primary School. They were cheered on by lots of parents and many children from the boy's football team. It was a very close game, with Ebor Gardens coming out on top, with a 2-1 win, despite St. Peter's having the vast majority of the possession and chances. The team was captained by Paris and our goal was scored by Kyra, who smashed in the rebound from a penalty. The celebrations following the goal were just brilliant! The team was: Laurele (GK), Abigail (GK), Paris (captain), Lemeka, Ilana, Chantelle, Valeria, Abiye, Stecy, Saba, Shameeka and Kyra. You played an amazing girls and we're all so proud of you! Our Parents' Group, which runs every Wednesday afternoon at 1.30pm, enjoyed a recent visit to Leeds Minster. They had a tour of the Minster from Canon Sam Corley and learnt about the rich history of the church. The Cubs had a fabulous weekend at the National Space Centre. They visited the planetarium, made model rockets, went on an alien hunt and much much more! 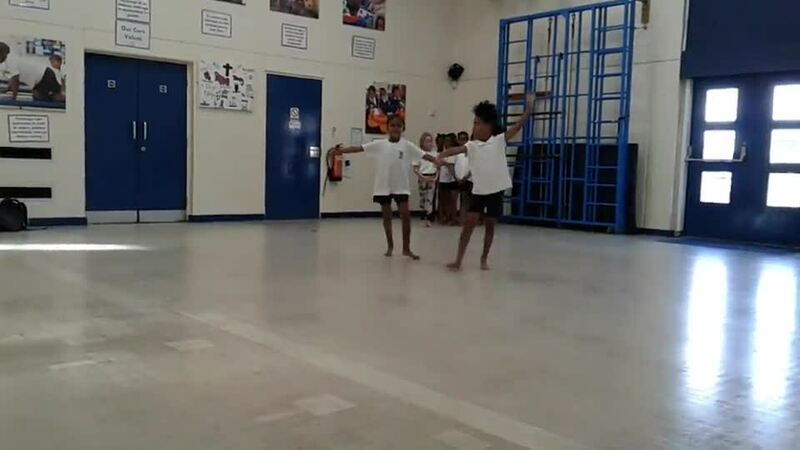 The Year 5 steel pan group have been working really hard - have a look at this video. At our Easter Service this year, some Year 6 children told the Easter story to the whole school and the Key Stage 2 children performed some beautiful songs that they had been practicing. Lots of parents came along and it was a lovely afternoon. On Thursday 25th February children took part in a Faith day Celebration at school. First the children met in the hall and sang with our special visitor, Bob Hartman. Bob is famous around the world for his work in sharing bible stories with children. Then the children went into groups and were mixed with pupils from all the classes in school. Each group were given a colour and they travelled around the classes throughout the day. At the end of the day we all gathered in the hall to spend time reflecting and celebrating what a great day we had had and how much closer we felt to God during the time of Lent. The 2 brilliant winners were Saba Medhane for Key Stage 2 and Naomi Paulos for Key Stage 1 - congratulations! Each year, the children in each class work really hard to learn a poem by heart. They perform their poems to the rest of their class and the winners in each class are then chosen to perform their poem in front of a panel of judges at the Rotary Recital finals. Once again, the children were amazing and performed their poems beautifully. The Key Stage 2 children have also been learning some special songs for the Recital event and these were sung spectacularly on the day - all in all a fabulous afternoon! Another Win in the Cup! On Monday 8th February, the Under 11s football team travelled to Menston, where they played in the next round of the cup against St. Mary's Catholic Primary School. After going a goal behind early in the game, St. Peter's quickly got on top and created a lot of chances. With time running out, Joel Owusu managed to pick out Joel Leigh, who equalised from close range. In extra time, Joel Owusu managed to get on the scoresheet himself, curling in a shot from long range. The game ended 2-1 to St. Peter's and that result puts the school into the quarter finals of the Leeds City Schools Cup. Meanwhile in the league, the boys remain unbeaten and now top the league with a game in hand. Two more games against local rivals, St. Patrick's and Shakespeare await. Hopefully two more good performances are just around the corner. Mr Robertson and Sam Leigh are both incredibly proud of the effort made by all of the boys and girls at football club this year. Together, we really are a winning team! For the second year in succession, performance poet, David Harmer, joined us in school, to launch our annual poetry recital competition. He was brilliant as always and gave the children lots of inspiration ahead of preparing their own poems to perform in their class semi finals. As you can see, the children got involved in David's performance and made wonderful Batman, Robin, Stinkerman and Smellboy characters! St Peter's are Attendance Winners! The Inner East Cluster ran a competition throughout November for all the Schools in our Cluster to see who could achieve the highest attendance. St Peter’s were the winners with 98.7% and Class 5 won the highest attendance within the school. Mrs Morton, the Attendance Officer at the Cluster came along to our assembly to present the Trophy to the school and medals to all of Class 5. Well Done Everybody – a Fantastic Achievement! The children had a fabulous Christmas party, with lots of fun and laughter - not to mention cakes and treats! Father Christmas at St Peter's! Reception, Class 1 and Class 2 were really excited when Father Christmas came to visit school. He brought them all a lovely present too! 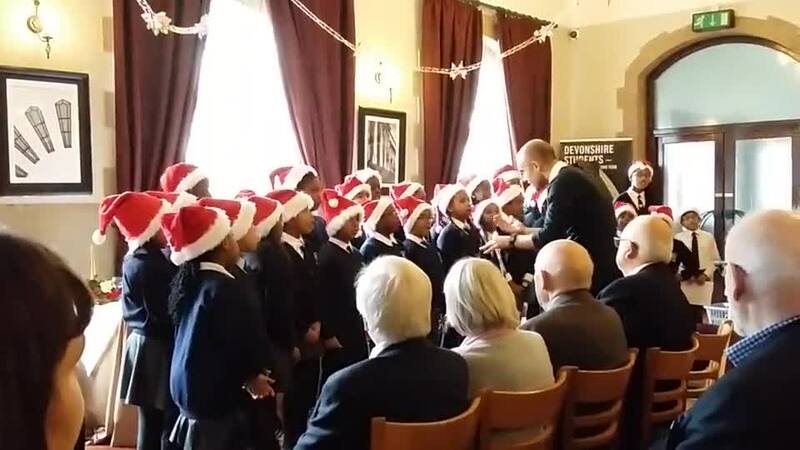 Our friends at The Rotary invited some children to sing at their annual Christmas lunch. Some Year 5's and 6's went along and performed beautifully. Also, Mrs Holliday was awarded a special fellowship by the Rotary for her excellent work at St Peter's. Once again the Key Stage 2 Christmas performance was a triumph! The children worked really hard and the parents enjoyed fabulous singing, dancing and acting. The Key Stage 1 nativity was a huge success and lots of parents came along to enjoy it. Well done to all the children - it was an excellent performance, with lovely singing. We had some Dental students visit school recently. They are doing a study to find out at what age children can clean their own teeth. Our children were a real help and enjoyed having lovely purple smiles! Our school councillors had a fantastic opportunity to work with the Burmantofts Housing Office to see how the local area could be improved. They walked round the area spotting areas for improvement and then reported their findings back to the Housing Manager. The St Peter's Street Dance Crew took part in a show to celebrate 15 years of Dazl. Lots of parents turned up to offer support and the children were amazing! The children all had a fabulous time at the Disco - there was some fantastic dancing! The children (and staff!) all enjoyed Children in Need day - we had a non uniform day, sold spotty biscuits and covered Pudsey Bear in small change - one member of staff even wore a Pudsey Onsie! Our annual International Week was a huge success yet again culminating with parents coming into school and bringing traditional foods for everyone to try. The parents had a lovely time and visited all the children's classes for a display of what the children have been learning throughout the week. At the end of the all the Workshops there was a performance for the whole school - Joel from Class 6 joined the singers for their final song. A Gospel Choir visited school this week and did a workshop with each class. The children loved it and the singing was amazing. Here are some clips of the class 6 boys and girls singing beautifully. As part of International Week, we had two drumming workshops in school; Key Stage 1 learnt Indian drumming and Key Stage 2 learnt African drumming. It was a very noisy day! Congratulations to Naomi, Joel, Trust, Saba, Rakshith, Jedidah, Deryck and Priscilla - the 2015/16 School Council Team! School Council Elections at St Peter's were very professional this year! Class 2 set up a polling station in the hall and all the children in key stage 2 cast their votes and placed them in the ballot boxes, ready to be counted. We held a meeting for all Reception parents to give out bags with lovely resources which will support children's learning in Reception. We were also able to provide some sets of resources for our Tigrinya speaking children. Many thanks to the Inner East Cluster for the funding for these amazing packs. Lots of parents of children starting school next September came to look round school this morning. Some lovely Year 6 children gave them a tour of school and answered all their questions. Please click on the link below to find out more about the new flu immunisation for children in Years 1 & 2. Wow! Look at our playground! Our new playground is fantastic! All of the children have had a go and love it! We had brilliant fun days to celebrate a brilliant year! The sun eventually shone and we had a great time. The winners of a visit from the ice cream van this year were Reception and Class 6 - their attendance has been amazing and the ice creams were thoroughly enjoyed! The whole school had fun on Spanish Day, dressing up in red and yellow like the Spanish flag and having fun with singing, counting, colours, games and art work. In assembly we sang the school song in Spanish and did some hand jiving to "La Bamba". Mrs Swailes cooked tortilla with some children from year 4. Miss Trew and year 5 had a lovely paella display. The whole day was a lot of fun and we hope to repeat the success next year. At a recent maths workshop at the Grammar School at Leeds, Shameeka and Tre'von showed off their amazing maths skills and both received 2 certificates for their excellent work - what superstars! We are so lucky to have been provided with another school minibus! We share both buses with All Saints' Primary and this allows both schools to be able to take whole classes out on trips in our very own buses! We are extremely grateful to Variety, the Children's Charity, as well as Endless LLP, the sponsors of our new bus - this will make such a difference to our school! After Friday's strange footprint find, the children made an eggciting discovery at the start of the new school week. As the gates were opened, the children poured onto the playground to discover a huge egg, hiding in a nest in the garden area. Quite eggstraordinary! We recently welcomed our new pupils into school who will be joining us in September. Whilst Mums and Dads joined us in the hall for an introduction to school, the new children spent time with their new teacher, Mrs Smith. We had lots of helpers from year 6 who greeted the families, showed them to class, served tea, sold uniform and even modelled some uniform themselves. They were a brilliant help! The new pupils came back smiling and we look forward to meeting them all again in September. A huge thank you to everybody, we managed to raise a whopping £348 for Comic Relief - well done! We had a First Aid Day when the children learned all about what to do in an emergency. Years 1 and 2 learned about how to phone 999, Year 3 and 4 learned about how to put people into the recovery position and Year 5 and 6 learned about CPR. Click on the link below to view a video showing how we don't just use our classrooms for learning at St Peter's!